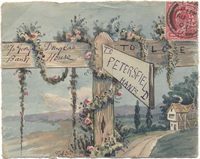 1891 Envelope from York to Beverley showing ST. PETERS SCHOOL YORK Coat of Arms on the reverse. 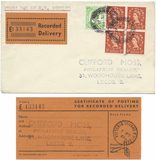 1847 Entire addressed to Otley and redirected to Huddersfiled, showing on the reverse a VERY FINE Ilkley/Penny Post IN RED, YK 1635. 1840 Entire to Calverley Vicarage near Bradford showing on the reverse a VERY FINE LEYBURN/PENNY POST, YK 1847. 1843 Entire to Grove Mill near Keighly showing on the reverse a very fine HUDDERSFIELD/DATE/᛭ SKELETON DATESTAMP, YK 1483. 1853 Envelope to Beverley franked by a four-margin 1d Red-Brown, SG 8, tied by a very fine BEVERLEY 67 numeral. On the reverse are VERY FINE BARMSTON (under Driffield) and LOWTHORPE (under Hull) undated circles in Blue. 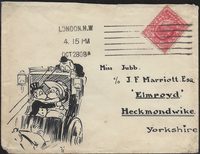 1835 Entire to Wetherby, Yorkshire, showing a very fine Harrowgate/Penny Post, YK 1283. Very Scarce. 1789 Entire addressed to Buckingham showing a SUPERB STRAIGHT LINE SETTLE IN BLACK, YK 2570. SUPERB! 1872 STAMPLESS ENVELOPE USED LOCALLY IN HUDDERSFIELD SHOWING A SUPERB BOXED 'STAMP NOT/VISIBLE' AND HANDSTRUCK '2' of Huddersfield in Black. RARE. 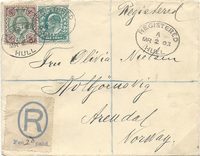 1865 Envelope to Upper Austria franked by Six 1d Rose-Red, SG 43, Plate 85 tied by very fine York '930' duplex cancellations. 1859 Envelope to Bradford with, on the reverse, a very fine GILDERSOME (under Leeds) undated circle in blue. 1835 Cover to Beverley showing on the reverse a very fine York 'TOO-LATE', YK 3381, in black. 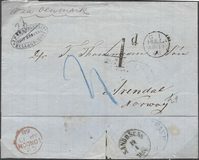 1838 Entire from Copenhagen addressed to "Pitmines, Arbroath" showing on the reverse a very fine step-framed HULL/SHIP LETTER, Robs S8, in RED. 1876 2½d Rosy Mauve, SG 139, Plate 2, O-E, tied to entire to Norway by a fine Hull 383 duplex. 1864 4d BRIGHT RED, SG 81, HAIRLINES, tied to Entire from Hull to France. 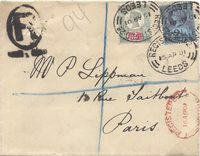 1864 1d Rose-Reds, SG 40, PLATE 'R17' lettered P-D/P-F and T-E tied to cover from Leeds to France.